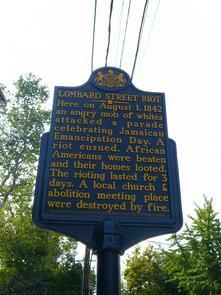 Pennsylvania Historical and Cultural Commission marker commemorating the Lombard Street Riot. Marker is at Starr Gardens. Text reads: "Here on August 1842 an angry mob of whites attacked a parade celebrating Jamaican Emancipation Day. A riot ensued. African Americans were beaten and their homes looted. The rioting lasted for 3 days. A local church and abolition meeting place were destroyed by fire."